Arcade Video Game published 37 years ago by Bally Midway Mfg. Wacko © 1982 Bally Midway. 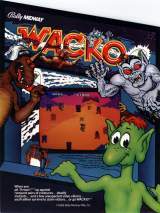 Wacko is a colorful single screen shooter, with excellent graphics for the time. You maneuver Kapt'n Krooz'r around the screen in his spaceship. 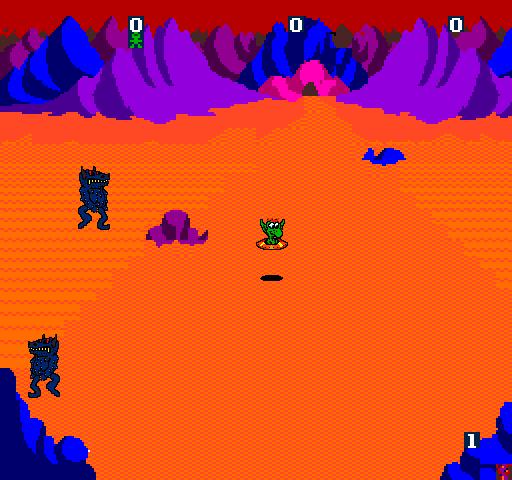 The terrain is an orange moon scene, various cartoonish monsters dot the landscape. You must blast the monsters in pairs to make them vanish. Later levels introduce even more complex rules as to what can be shot. You control your ship with the trackball, while using the joystick to aim and shoot. The controls feel natural with a little practice, but the game quickly becomes very difficult on the higher levels. The game originally had a wizard shooting at cute animals but Bally/Midway execs thought it was too cute and needed an edge. Monsters were designed by Scott and put in instead, plus Bally/Midway also called him at the last minute to replace the wizard with the little green alien from "Kozmik Krooz'r". The slanted cabinet was an idea by Marvin Glass which required the trackballs to be installed upside down to work properly. This title takes the prize for having the strangest dedicated cabinet ever made The Wacko cabinet is sloped, both the control panel, and the marquee are set at an angle. The right side of each being about three inches lower than the left side. This means that the joystick and trackball are both at an angle. This is the only machine ever made to feature a sloped control panel (a distinction which it will probably keep for a long time). Sony PlayStation 2 [AU] (2004) "Midway Arcade Treasures 2"
[US] Microsoft XBOX (oct.11, 2004) "Midway Arcade Treasures 2 [Model MWO-3201W]"
Nintendo GameCube [US] (oct.11, 2004) "Midway Arcade Treasures 2 [Model DOL-GAYE-USA]"
[US] Sony PS2 (oct.11, 2004) "Midway Arcade Treasures 2 [Model SLUS-20997]"
[EU] Microsoft XBOX (oct.29, 2004) "Midway Arcade Treasures 2"
[EU] Sony PS2 (oct.29, 2004) "Midway Arcade Treasures 2 [Model SLES-52844]"
[US] PC [MS Windows, CD-ROM] (feb.17, 2006) "Midway Arcade Treasures Deluxe Edition"